You most likely already need to use your furnace, at least occasionally. Hopefully, you performed the annual furnace maintenance. This kind of maintenance is very important for proper functioning of the heating system throughout the heating season. Your furnace was dormant for the better part of the year, so it definitely needs some attention prior to everyday use to prevent breakdowns. If, however, you do experience problems with your furnace, you need to act quickly. You don’t want to be left without heating when proper winter sets in. Contact a professional and experienced heating service like https://www.actionac.net/heating-system-furnace-repair-san-diego/. One of the most common problems with furnaces is short-cycling. So, what is short-cycling and how do you recognize it? Chances are you have heard about this problem associated with air conditioning units, but it can just as easily happen to the heating systems and for the same reason. Namely, short-cycling happens when your furnace starts and stops too quickly and too often. There are several possible reasons why this could happen. In most cases, you should able to identify the problem, but fixing it is probably out of your hands, and you will probably need professional help. This problem should be evident from the first time you turn on our new furnace. You may think that bigger is always better, but it doesn’t really apply to furnaces. You don’t want the biggest thing on the market, you want something appropriately sized for your home. If you have miscalculated and gotten a furnace which is too powerful for your home, the result is short-cycling. Essentially, your furnace is too effective at heating your home. However, that comes with a drawback. It means that your furnace will not be as economical doing it. It will expend too much energy in a short time, then stay inactive for a period, and then repeat that process. A more economical setup is an appropriately sized furnace which will work continuously. Not only will it be more economical, but it will also help with reducing the wear and tear, so your furnace will serve you longer and it will be less likely to break down. Another reason why your furnace keeps turning on and off so frequently may be due to overheating. Your furnace may be shutting down automatically to prevent any more severe damage. One of the biggest concerns with this issue is carbon monoxide leaking into your home. Carbon monoxide is odorless and colorless, so the only way to figure out whether it is in your environment is to have a carbon monoxide detector close to your furnace. The main cause of overheating is the restricted airflow, whether it is a dirty air filter or a blockage in the vents. This will trap very hot air near your furnace and cause some physical damage to your heat exchanger, leading to the problems listed above. Maybe your furnace is not to blame, maybe it is getting confusing inputs from your thermostat. 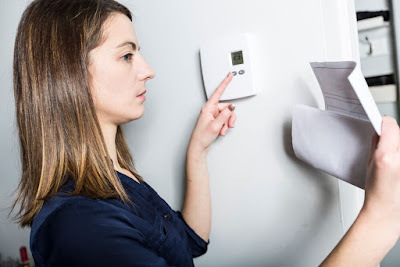 The thermostat tells the furnace when to start and how hot it should run, so if the problem lies in the thermostat, your furnace can experience a whole range of problems, including short-cycling. You can test this by setting your thermostat to different temperatures and monitor the changes. However, ultimately, you will need a skilled professional to come and take a look at the problem. Short-cycling is not only a nuisance, it could be an indication of much more serious problems, which is why you should treat it seriously and consult your heating technicians as soon as you determine that there is a problem.